Hey! There's something in there! I was heading out to the market. I had dropped a couple of bags on the floor near the front door and went to put on my shoes. Walking back to the dimly lit entryway I bent over to pick up the bags and Hey! There was something in there! 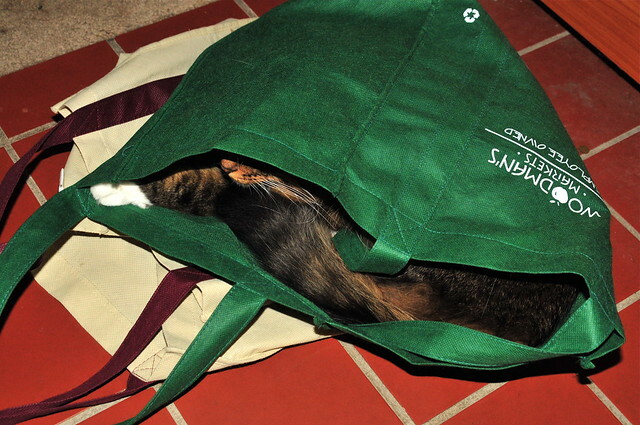 Nala had other uses in mind for the bags, apparently. We have had her for a year, and she has never demonstrated a proclivity to hiding in bags, so it caught me off guard. Never one to miss a photo op, I popped off this pic and while writing this she got bored and evacuated the bag.